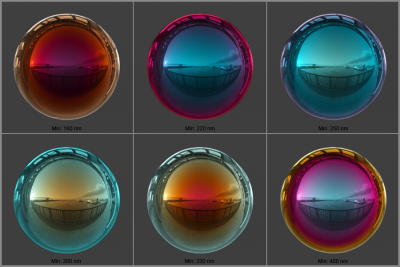 This Texture map plugin reproduces the effect of thin film interference on a surface. 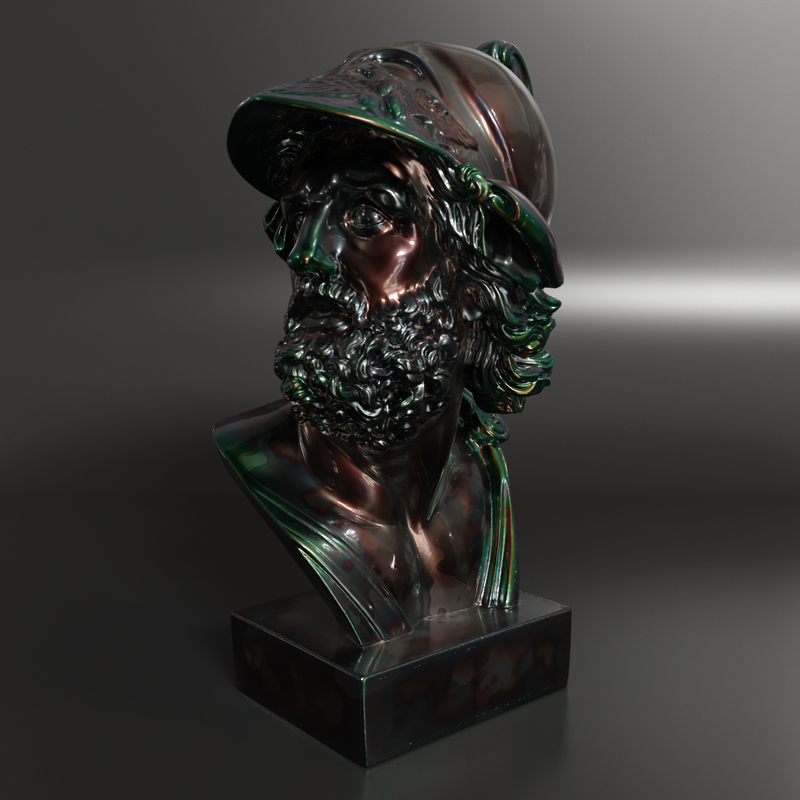 The plugin can be used as a reflection color map in a material with the Fresnel option of the material turned off (this plugin does its own Fresnel calculations). Min – the minimum thickness of the thin film, in nanometers. Max – the maximum thickness of the thin film, in nanometers. 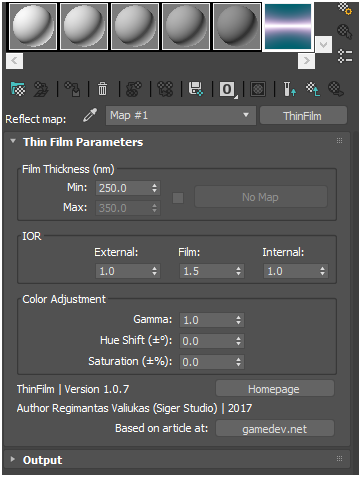 Map – a texture map that specifies the actual thickness of the film between the specified Min and Max thickness values. Normally this would be something like a Noise map to give some variation to the interference effect. If this is left blank, the Min parameter specifies the film thickness. External – refractive index of the medium surrounding the material. Normally this is set to 1.0 for air. Film – refractive index of the medium that the thin film is made of. Internal – refractive index of the medium below the thin film. Gamma – specifies the gamma correction value. Hue Shift – lets you change colors using a standard Hue spectrum. Range = -180…180. Saturation – the intensity or purity of the colors. Lowering the Saturation value removes color, causing the color to tend toward grayscale, while raising it intensifies the color. 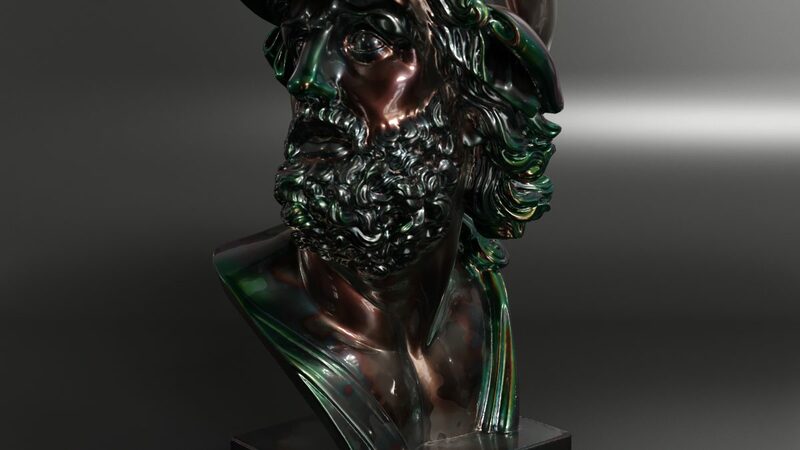 Copy file “ThinFilm_xxxx.dlt” to 3ds Max\\plugins directory (If you have installed older version – delete the old file!). * Performance optimization (up to 50%). * Added standard Output dialog. * Fixed Thread Safety issues.